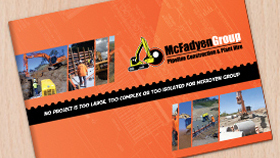 McFadyen Group - Turn to McFadyen Group for reliable and affordable machine hire in Brisbane. We'll maximise your construction business' efficiency and savings. McFadyen Group is a leading and renowned pipeline construction industry in Australia, ever growing and constantly developing to meet all our client needs and expectations. We are consideredamongstthe leading civil work contracting companies in Australia. McFadyen Group is a privately owned industry focused on providing our clients with pipelines and concrete construction services.We also provide machine hire and loader hire service in Brisbane.Most of our reputable qualified staff members have over 20 years of experience in construction and the civil contracting industry. McFadyen Group is one of the most reliable and trusted pipeline and civil construction companies in Australia. McFadyen Group is alsoknown for accomplishing a number of high scale projects related to machine hire and loader hire in the Brisbane area. Among our services we are best known for our construction services, highway construction, highway upgrade services, railway line construction services, tunnel construction services, mining infrastructure services, subdivision services, plant hire (wet & dry) services etc. If you are looking for a company from whom you can hire equipment in Brisbane then you should consider the trusted and highly renowned name of McFadyen. We guarantee the best service for any project, no matter the size. If you would like more information about our services then please contact us. We are happy to answer any questions or discuss a quote for one of our many services with you.